This is an advertisement for Glover's soap extract. The Public Health Bill was passed in 1848 and this helped to improve water supplies and in 1853 the Soap tax was abolished allowing local manufacturers to produce their own soaps. Personal hygiene was important and for the first time everyone of every class could afford to buy soap to keep both themselves and their homes clean. 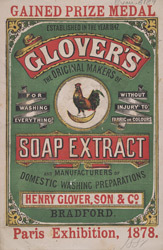 Companies like Glover’s’ mass produced soap and ensured that it was sold all over the country.